Sleek and textural, this pretty little side table is perfect for a Regency or Global inspired space. The slender legs play with proportion, creating a delicate silhouette. The hammered gold finish gives an exotic, layered look. 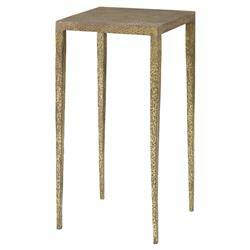 This accent table is a perfect piece with which to mix metallics.